German physician and medical author; born at Exin, province of Posen, Prussia, March 28, 1858. After having completed his studies at the gymnasium, he attended the medical courses at the universities of Berlin, Halle, and Leipsic, graduating as doctor of medicine in 1880. In 1882 he established a practise in Berlin, studying especially the diseases of the digestive tract, and opening a dispensary and hospital for the diseases of the abdominal section of the alimentary canal, the first of its kind in Germany. Since then Boas has become a specialist in this branch of medicine. Boas is the author of numerous essays and of the following works: "Diagnostik und Therapie der Magen-Krankheiten," Leipsic, 1890; "Diagnostik und Therapie der Darmkrankheiten," Leipsic, 1899. 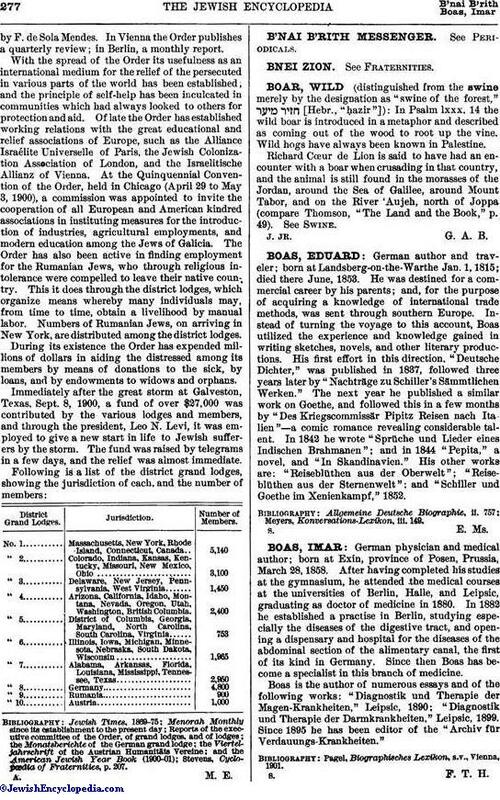 Since 1895 he has been editor of the "Archiv für Verdauungs-Krankheiten."